Jack Bornstein sent in this shot. 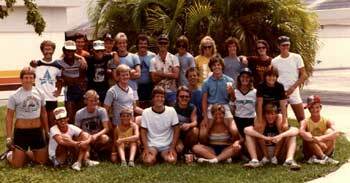 "Here's a picture of the 1983 Spirit of Atlanta drum line taken during the week of the Miami DCI finals at our host site in Sunrise, Fla. I'm the guy with glasses and a mustache at the left end of the seconnd row. I played the number two bass drum, and while the details sometimes get fuzzy over time, I will always fondly remember the summers I spent touring with Spirit." Thanks Jack!